A record breaking Carlisle [UK] firewalker who ended up in hospital after his world-beating show in January is hot-footing it back to Belah School tonight for a fiery fundraising event. Scott Bell will mentor 10 parents as they brave the red-hot coals to raise cash for the school. Scott broke the world record for firewalking in January at another fundraiser for the school, when he walked 250ft over temperatures of up to 1,300 degrees Fahrenheit. But the dampers were put on his achievement when he ended up in hospital for 10 days – suffering from burned feet. Now fully recovered, Scott insists the burns were a one-off and he is mentally and physically prepared to face the fire again. Giant paw prints mystery—real or hoax? You judge. Unexplained giant paw prints have today left an Ipswich couple speculating over whether a wild animal is stalking the neighbourhood. Jacqueline and Richard May, of Foxhall Road, are baffled by a series of prints – seeming to have been made by an animal with claws or toes – left in their garden…Mrs May, 64, said: “You can clearly see toes but Im at a loss for what it is. They are far, far too big for a cat. Its more like a horse. More curious sightings at the link above. 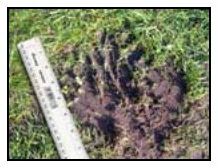 November 12, 2006 Posted by oldstersview | Uncategorized	| Comments Off on Giant paw prints mystery—real or hoax? You judge.